(Bloomberg) -- U.K. living standards stalled last year and child poverty rose, according to figures published Thursday. 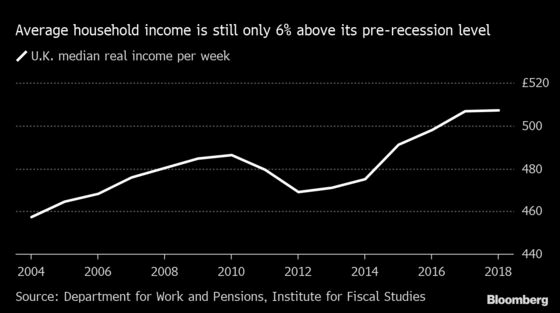 The Department for Work Pensions said that real incomes were no higher in 2017-18 than they were a year earlier as inflation outstripped wage growth and welfare benefits were frozen in cash terms. These factors were mitigated by rising employment. Around one in five households were living in poverty, defined as having an income 60 percent below the median, after accounting for housing costs. The number of children in poverty rose by 200,000. They total around 4 million and 70 percent of them live in households where someone has a job. Campaigners blamed the rise on cuts to in-work benefits as the government seeks to erase the budget deficit. “The political conversation around austerity may have shifted but the lived experience of it hasn’t for millions of families,” said Adam Corlett, senior economic analyst at the Resolution Foundation. The think tank predicted that child poverty will rise to around 37 percent by 2023-24 from the current 30 percent. The Institute for Fiscal Studies noted that 2017-18 was only the fourth year in the last 30 where median income failed to grow in real terms.